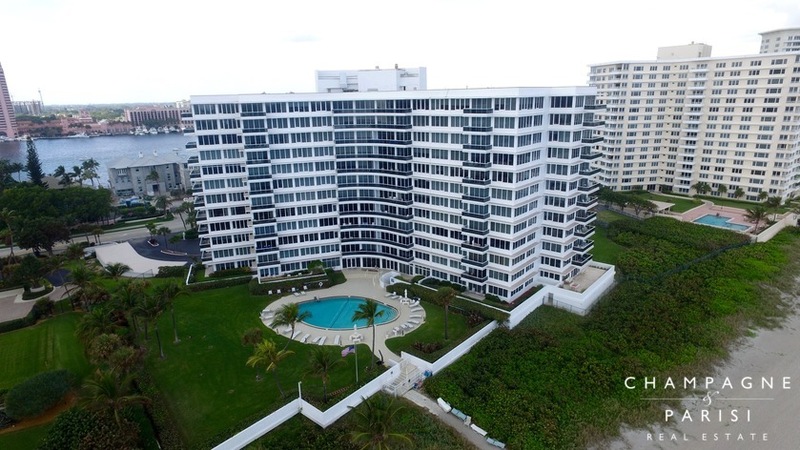 Sabal Point is a waterfront luxury condominium building that sits on 16 acres of beautifully manicured land between Lake Boca Raton and the Atlantic Ocean on South Ocean Boulevard in Boca Raton, FL. This active adult (55+) community consists of a single twelve-story building with 125 condos that offer panoramic views of the city of Boca Raton, the gorgeous coastline, and the sparkling waters of the Intracoastal Waterway. Condos for sale in Sabal Point offer one to three bedrooms and range from approximately 1,200 to over 2,400 square feet of luxurious living space. Many of the condos have been updated since its development in 1987 with modernization in a unique villa-style. Units at Sabal Point feature private entrances, marble foyers, vaulted ceilings, large master suites with spacious walk-in closets, private garages, attic storage space, luxurious master baths with whirlpools, sundecks, and in-unit washers and dryers. Condos at Sabal Point also offer spacious balconies with some of the most spectacular views available in the area. Sabal Point also recently underwent major renovations to the interior and exterior of the building which included complete concrete restoration and installation of a new roof, as well as a newly redesigned lobby entrance, new hallway carpeting, and new exercise room with state-of-the-art equipment. Located on South Ocean Boulevard between Palmetto Park Road and Camino Real, this oceanfront condominium community provides residents with a prime location convenient to many of the area's most popular attractions. With the beach just steps from the door, Sabal Point is just a short distance from many of the community parks including South Inlet Park, which offers fishing, swimming, playgrounds, walking trails, and beachside pavilions. The community is also a short distance from Deerfield Beach and all of the action and excitement happening in downtown Boca Raton. Residents are close to Mizner Park, which offers some of the finest dining, shopping, and entertainment options in the area. Residents may also enjoy being within close proximity to many golf courses, as well as the exclusive Boca Beach Club and the prestigious Boca Raton Resort & Club. Similar condo buildings close to Sabal Point that you may also want to visit are Sabal Shores and Chalfonte, both which also offer luxury waterfront condominium living in Boca Raton. If you are interested in purchasing a condo in Sabal Point or would like to learn more about any of the other luxury condominium communities in Boca Raton please call us at 561-998-9015. You may also reach us by completing the brief online contact form provided below and one of our expert agents will reach out to assist you. We at Champagne & Parisi Real Estate look forward to assisting you in finding your dream condo in beautiful Boca Raton, FL!